The holiday season isn’t here yet, but most of us can feel it coming. Store merchandise, commercials, and that chill in the air, all mean that Christmas and the Holidays are just around the corner. If you are looking for a way to change things up for this year’s party or want to make Christmas morning extra special, why not consider crepes? Sweet or savoury, these tasty and healthy meal options can be customized to provide everyone with their perfect plate. Homemade Crepes: There is no better way to wake up on Christmas morning than to the smell of fresh coffee and fresh crepes! If you have always wanted to perfect the art of homemade crepes, look no further than our crepe machine. It simplifies cooking to give you those perfect, thin crepes every time. Plus, it is on sale this month! Our crepe machine is only $175 (regular price $249) for the month of November, making it the perfect affordable addition for your kitchen. It is also a great gift for the family foodie. Crepe Catering – Whether you are planning the annual office party or are having friends gather around the tree, crepe catering provides the perfect main course and dessert station for guests. Our portable crepe station allows us to set up in your home or office and provide everyone with hot, nutritious meals made before their eyes. Allow the food to become part of the event with crepes that are as fun to watch as they are to eat. Visit Crepe Delicious – The holidays can be a lot of work. Whether it has been a long day of shopping or you just need to get out of the house after hosting family, a break is necessary to treat yourself! 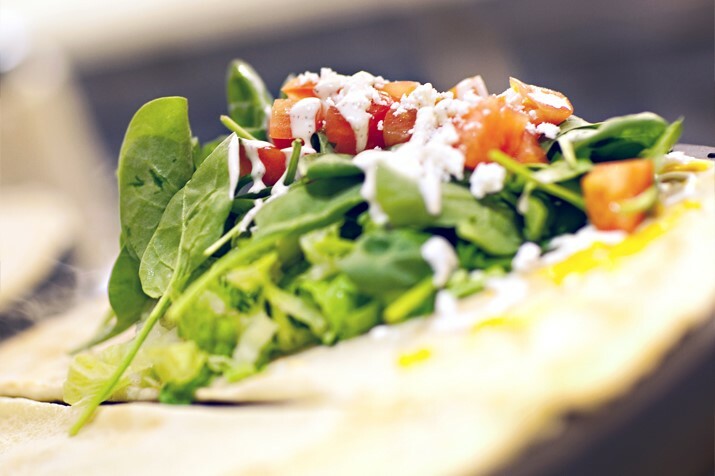 At Crepe Delicious, our menu is indulgent but only because items are made with wholesome, fresh ingredients. This month you can try our featured Montreal Smoked Meat crepe. Save your money for stocking stuffers and enjoy a meal that leaves you feeling light but satisfied. Make the most of this holiday season with delicious sweet and savoury crepes from Crepe Delicious. Contact us today to learn more about our crepe catering services for your holiday party or request a quote online. Visit a Crepe Delicious location today. Enjoy a Montreal Smoked Meat crepe while you also pick up your own crepe machine and save! Check out our menu to find your perfect toppings and get inspired for your own creations.